Lockheed Martin says that one of the most commonly known fighter jets might soon be made in India. 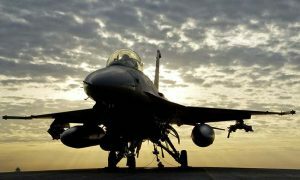 On Monday, Lockheed Martin said its F-16 classic aircraft will be made in the Asian country of India if the government there grants it a new contract to supply the country’s air force with new fighter jets. The U.S. based company will make the jets via a partnership with Tata one of India’s industrial giants, the two companies announced Monday during the Paris Air Show. Lockheed, based in Maryland, hopes to fend off the competition from Saab the Swedish manufacturer and its fighter jet Gripen for the potentially large order from the Air Force in India. Insiders believe that India is looking to purchase as many as 150 new warplanes and has a budget of as much as $12 billion. Tata and Lockheed confirmed that the production of the F-16 in India would move ahead only if a lucrative order from the air force in India is confirmed. If the contract is confirmed, India would be the manufacturing as well as export base for all of Lockheed’s F-16’s worldwide. The pledge by Tata and Lockheed is a positive nod to the “Make in India” campaign by India’s Prime Minister Narendra Modi that has a goal to boost manufacturing locally. Tata and Lockheed are in negotiations as well to manufacture F-16 components somewhere in India if the deal with the Indian air force does not materialize added a spokesperson from Tata. Lockheed looked to stop any of the suggestions that its manufacturing push in India would go against the agenda of President Donald Trump of Buy American and Hire American. The production of F-16s in India supports thousands of U.S. supplier’s and Lockheed jobs in the United States, said the jet maker. Next week, Modi is expected to make a visit to the White House. Tata and Lockheed have been partners for a long time. India based Tata helps make parts for the C-130J Lockheed transporter aircraft as well as for the Sikorsky S-92 helicopter. Close to 3,200 F-16s currently are being flown by 26 nations across the globe. Tata and Lockheed are hoping that their most recent announcement will help to add India to the long list of nations that use the F-16.